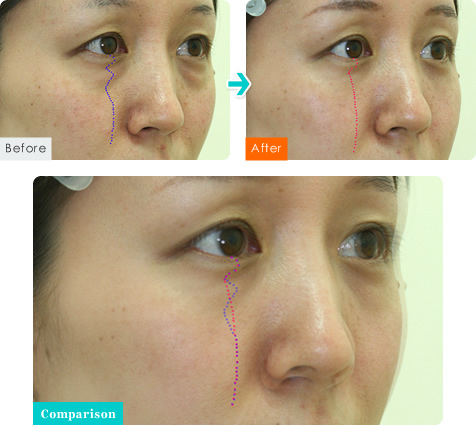 Our advanced orbital fat pad removal method treats under eye problems without any swelling and downtime. Three major highlights of the treatment are: 1) small affected area 2) short treatment duration and 3) less amount of anesthesia. 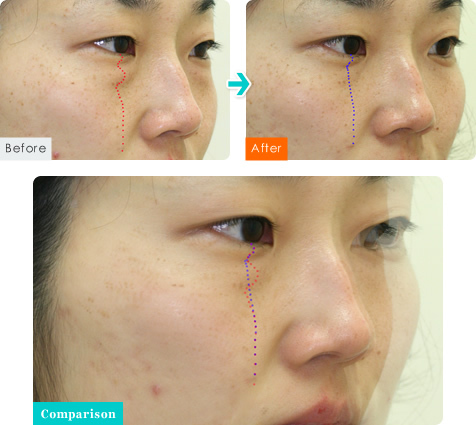 A high-frequency laser knife not only reduces bleeding and pain but also leaves negligible scar. It takes approximately an hour to remove the fat pad from both the sides. You can see the improvement right after the treatment. The collected fat is processed to maximize fat cell survival and injected into the patient’s under-eye area from the cheek by using a special cannula. This method not only removes eye bags but also improves dents, forming natural and smooth curves from the under-eye area to the cheek. Why do we combine degreasing with lipo transfer? 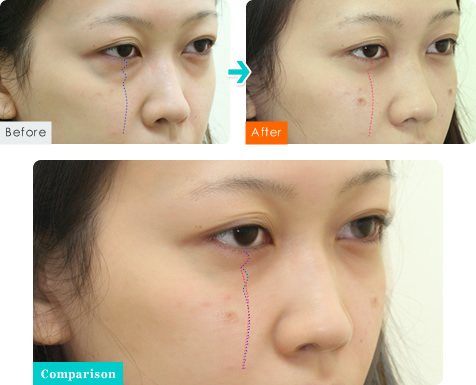 Degreasing (Transconjunctival Blepharoplasty) is an effective treatment to improve eye bags caused by the orbital fat pad inflation. However, degreasing alone is not enough to create young-looking curves under the eyes or on the cheeks. It removes extra puffiness under the eyes by eliminating some percentage of fat pad but does not flatten the dented area. Also, degreasing by itself does not improve sagging skin, which is another cause of eye bags. That’s why, at Theory Clinic, we highly recommend receiving degreasing together with lipo transfer to get the best results. 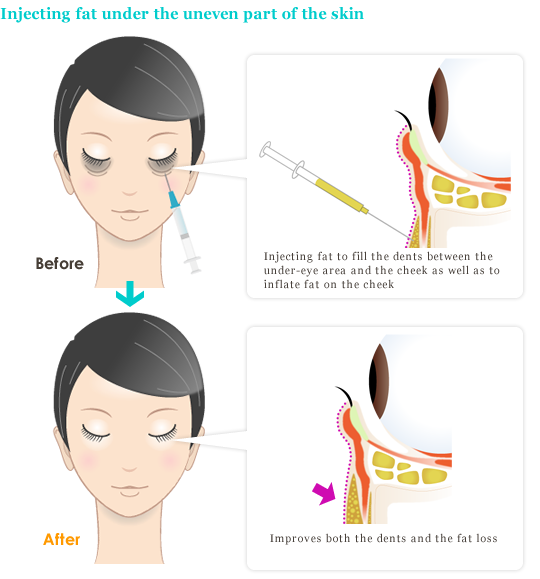 Lipo Transfer is a method to improve dented area by injecting the fat that has been collected by degreasing and processed to maximize fat cell survival, into the patient’s under-eye area from the cheek by using a special cannula. The puffiness under her eyes is caused by the orbital fat pad inflation. The shadows under the puffiness are called “black eye bags. Because she has deep orbits, her dents will be emphasized by degreasing. Lipo transfer is needed to reduce the dents. Puffiness under the eyes has gone. Her cheeks look as though they have been lifted up. 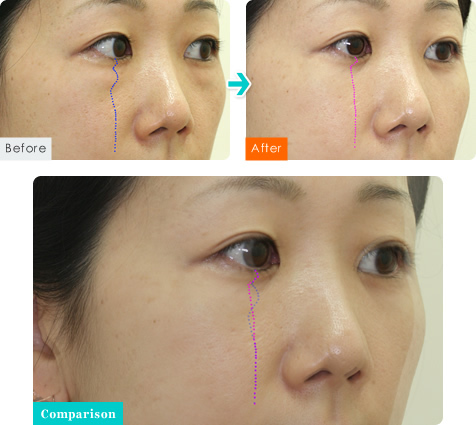 Compared to her face right after the treatment,a little swelling and redness is visible under the eyes. Glasses can hide the swelling and redness. 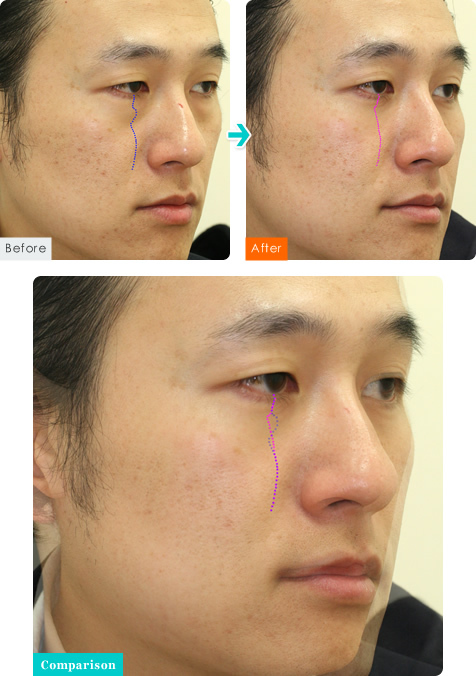 Degreasing is a method that reduces the inflated orbital fat pad under the eyes. Theory Clinic’s “Degreasing plus Lipo Transfer” treatment not only reduces the fat pad inflation but also smoothes undesirable bumpy S-shaped curves. Degreasing alone can correct the S-shape curves to a certain degree; however, in most cases, it is difficult to obtain a satisfactory result. A key to success in the S-shaped curve alignment is to remove “the right amount” of the orbital fat pad. Too much removal produces dents and too little removal leaves puffs. The amount of fat that should be removed differs substantially among individuals. It is hard to judge “the right amount” by looks and it is almost impossible to determine it while a patient is lying on an operating table. That is why we, at Theory Clinic, use degreasing and lipo transfer in combination for aligning the S-shaped curves.